We’re only a third of the way through the year, and already so many It dresses have emerged. First, there was leopard print, which, after taking over skirts and coats, is setting its sights on dominating the frock scene. Then things got brand-specific when a host of top influencers wore M.92’s smock dress. 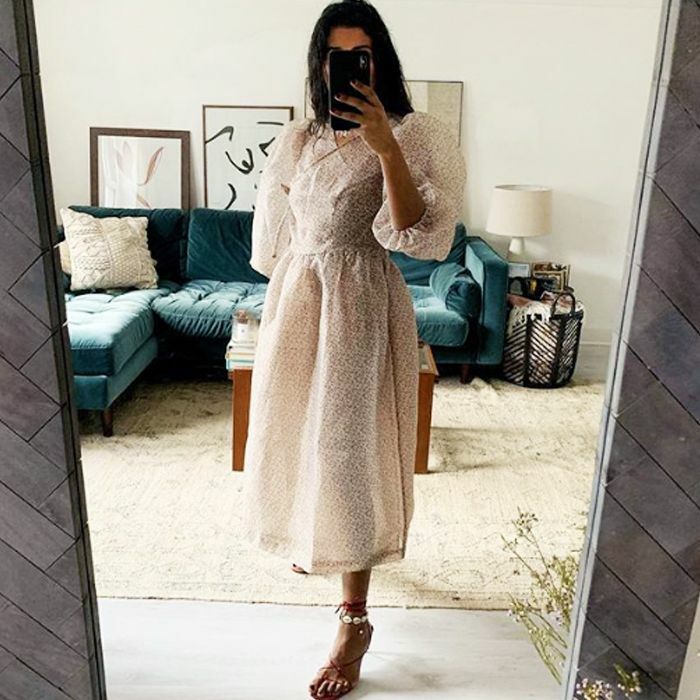 Throw in the Self-Portrait maxi both Jessie Bush and Aimee Song bestowed with their seal of approval, and there’s no denying that 2019 is shaping up to be the year of the dress. As such, we’ve spotted yet another dress trend that’s proving to be just as prolific on the high street as it is in designer circles. Usually associated with ’80s bridesmaid gowns, satin dresses have undergone a reinvention of late. Instead of the heavy duchess satin most commonly found on bad prom dresses, the fabric is gradually become thinner and lightweight, making its overall vibe sultry as opposed to frumpy. Most of us would associate modern-day satin with slip dresses. But it’s used to create just about every silhouette you can think of. So whether you prefer oversized silhouettes to garments cut close to the body, rest assured this is one dress trend you won’t be exempt from. With a luxurious look and touch, we suspect satin dresses will be in high demand for summer weddings and soirées. However, that doesn’t mean you need to keep them for formal occasions only. With a simple switch of shoes, you can make them work for less formal outings as well. With minis, midis and maxis to choose from, in a variety of gorgeous hues, keep scrolling to see and shop our edit of the best satin dresses to shop now. As far as necklines go, this one is absolutely divine. This dress looks like it’s a costume from The Great Gatsby. Gorgeous. Kitri’s sellout silhouette now comes in a gorgeous lilac. This rust hue will look gorgeous on all skin tones. The draped detail on this midi dress will flatter fuller busts. The Victoriana dress gets a directional update in fiery red. Look closely and you’ll see this dress boasts tiny polka dots. Try clashing them with fishnet tights. For fancy soireés, look no further than this Albus Lumen gown. We clocked the pink version of this dress so many times over fashion month. Give this midi a dressing down with a leather biker jacket and trainers. We would never have guessed this chic dress came from the high street. Bravo, Arket. This rich shade will make your skin glow. A slip-style dress you can actually wear a bra with? Topshop, we’re eternally grateful. Minidresses always look their best when the short hemline is balanced out by long sleeves. Temperley may be known for its embroidery, but we think this satin dress is equally as special. This is just calling out to be worn with an oversized checked blazer and strappy heels. If you’re keen to make a statement, this tangerine dream is a no-brainer. Satin dresses needn’t be block-coloured, as this leopard-print Warehouse number proves. No dress roundup would be complete without a piece by The Vampire’s Wife. Topshop’s sellout slip is now back in an array of pretty hues, though this pink shade is easily our favourite.